A walkway is an essential part of your outdoor and it enhances the beauty of landscape in your home. 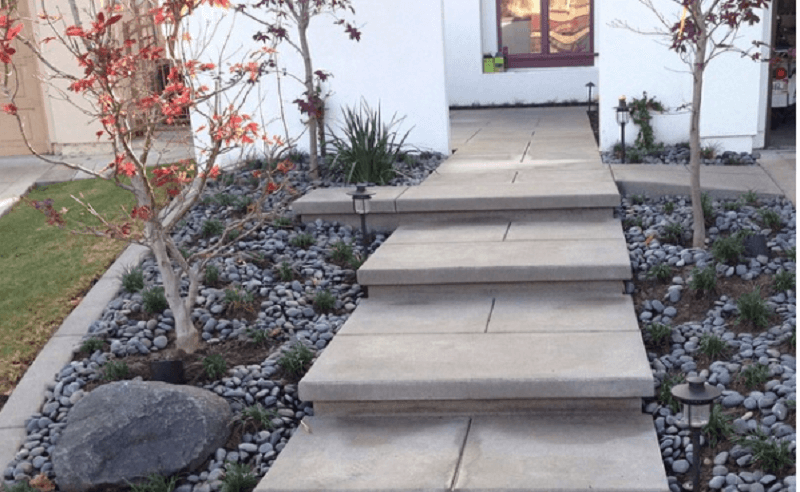 Here, we will be discussing five ultra modern concrete paver ideas, along with the creative steps that you can take as a homeowner to design a beautiful walkway at your home. Walkways that are done with precast concrete paving slabs/pavers are bound to grace homes with modernity. These pavers are usually rectangular or square, and rarely circular in shape. The precast pavers are very popular today because they provide the homeowners with a lower priced alternative to natural stone. Another way to create an ultra modern walkway at home with ease is to combine giant rectangular concrete pavers with decorative stones. This combination makes for a beautiful look and merges well with the concrete walls of your home. However, it can be a tough job to keep the stones (the ones you have used as filling material for the surrounding space) free of leaves and other organic material. Therefore, be careful before you opt for this arrangement. This simple yet trendy look can easily be achieved by resting rain-glossy square pavers in a bed of landscape rock. This design has a lot of advantages as the tight spacing of pavers not only makes the walkway wheelchair-accessible, but also ensures longer life of the paving stones. What’s more is that these pavers are least affected by weather change and staining. This extreme contrast of plush lawn grass with the crude gray world of landscape stone is a timeless beauty. Use your imagination to create a fascinating walkway for your home, as this concrete paver idea can be used for paths of any shape. This is an easy to construct walkway if your home doesn’t have one before! You just need to place a collage picture frame on the ground and pour in mixed cement. Repeat this process until you have one of your neighborhood’s classic walkways. Furthermore, you can also go for a color-tinted scheme if you want a distinctive look. The above listed modern concrete paver ideas will not just enhance the curb appeal of your home, but will also leave an everlasting impact on all your arriving guests. This entry was posted in Natural Stone Pavers and tagged Concrete Paver Ideas, Concrete Paver Ideas for Your Walkway, Modern Concrete Pavers, Precast Concrete Walkway on March 26, 2018 by Socorro González. You’ve got great tips for hardscaping here. Combining concrete with decorative stones would look great. We’ll be careful with the arrangement, like you said, but I think that would make a fantastic walkway in our yard.